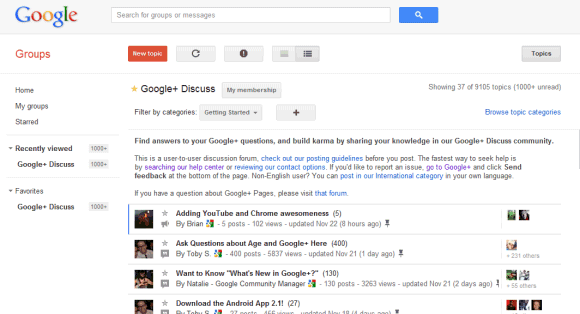 Back in 2009, many of the official Google discussion groups moved from Google Groups to a new platform called "Google Help Forums". Now it's time for them to go back to Google Groups. Google+ and Chromebooks Central already use the new platform and you'll be able to find the upcoming forums if you bookmark this odd URL. The URL isn't that "weird". They've used the googleproductforums.com for the migration (perhaps permanently) and used Google Apps to create forums for their domain. It seems a good way to fence of all these Google-centric forums from regular public Google Groups. Also it's good to see them dogfooding this. That's actually a great idea. I've always wondered why they took it out in the first place. Glad to have it back to where it should be.